What is a fissure sealant? A fissure sealant or sometimes called a dental sealant) is a preventative treatment that seals the pits and grooves on the biting surfaces of your back teeth in order to protect them. A special dental paint is essentially flowed into the chewing surfaces of your teeth to seal them. This prevents plaque, bacteria and food getting into the nooks and crannies, helping prevent cavities and making your teeth easier to clean. The white filling materials used are either a composite resin, or a GIC, or a combination of the two called a compomer. Why choose Dr Workman to look after you? Not only is Dr Workman a very good dentist, he has genuine caring nature and always makes sure you feel truly looked after. This is why he has such a loyal following of, families, young professionals right through to our older generation. With over 12 years experience, he is young, passionate, great at what he does and has an excellent aesthetic eye. If you would like a dental professional you can really trust, who places your health, happiness and comfort as an absolute priority, then you would be hard pushed to look any further. If you have typed ‘dentist near me’ then our state of the art Maroubra dental practice won’t be far away. Why would you need a fissure sealant? Molar teeth contain a complex pattern of pits and fissures on the biting surface: the pits are divots or indentations and the fissures are essentially grooves or valleys. No two teeth are alike! If the pattern is nice and shallow and easily accessible to the toothbrush, then for the most part fissure sealants aren’t necessary. However if they are deep and narrow, they can harbour bacteria and keep food particles away from the desperate attempts of our toothbrush. Over time, if these areas are repeatedly missed, decay and eventually a cavity can result. Decay is most likely to occur here, and in between these teeth… where flossing is critical! Who should have a fissure sealant? Fissure sealants are most commonly carried out on children, when the teeth first erupt through the gum – this is when the enamel is weakest, vulnerable and susceptible to problems. Not every child will need fissure sealants, but if they’ve had decay and fillings in their baby teeth, have poor oral hygiene or have patterns that will present difficulty in cleaning then they are recommended. Any medically compromised, or special needs children will also benefit from this treatment, as tooth brushing tends to be less effective for these patients. Which teeth should be fissure sealed and what’s the time-scale? In a nutshell it’s these unfavourable patterns you need to protect from problems. The most common tooth to be fissure sealed is the first permanent molar, which comes through behind all the baby teeth, at around the age of 6. The next most common tooth is the second permanent molar, which comes through around the age of 12. Only occasionally is it necessary to seal the premolars. If you get decay or problems in any of your first molars then the rest should be sealed as a matter of course. Fissure sealants are generally placed in children and teenagers, and only in adult teeth not baby ones. Occasionally, however in certain circumstances they can also be advantageous in adults. What are patients saying about Dr Jamie? It is a very simple procedure… only made a little tricky by the size of a child’s mouth, their saliva flow and inability to sit still. We clean the tooth, paint a special little acid on the tooth, wash it off, dry it and flow the dental sealant into the pattern before setting it in place with the blue dental light; a little suction and a bit of cotton padding and that’s it –a couple of minutes! No anaesthetic is required and often no adjustment either. What are the risks and problems? 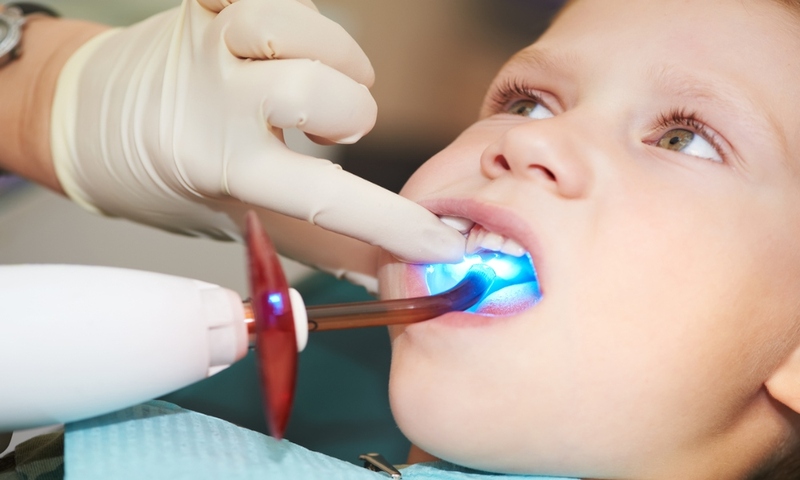 The only real risk is that the sealant doesn’t bond fully or only partially bonds, thus allowing bacteria to seep underneath- in these cases a cavity can form without your knowledge; at least until it gets big enough, or is discovered on x-rays. For this reason, if we can’t get moisture control we may decide not to place it until we can, and instead apply a high fluoride varnish to help protect the enamel in that area. This can be done every 6 months, until the sealant can be placed effectively. Thinking of becoming a patient with us? We’ve put together all the information you need to decide if we are the right dentist for you. For the most part, they last a few years whilst the enamel matures and becomes more resistant. Sometimes they’ll come off and can simply be redone, but often they last considerably longer. It all comes down to the bonding process. It may feel a little spongy to the bite but be assured, it is fully set and you are good to eat and drink by the time you leave. Alternatively if you would prefer to speak with someone directly or book an appointment, please call our lovely staff at the Maroubra Dental Centre on 02 9133 4005. Dr Jamie’s education site; Jamiethedentist.com where you can hear him speak and read about TOPIC in a lot more detail.